According to Mahadevi dasi, by Lord Krishna’s mercy and His devotee’s prayers, the operation that Parvati devi dasi underwent was successful. The use of mobile phones over a long period of time can raise the risk of brain tumours, according to a Swedish study, contradicting the conclusions of other researchers. Last year, the Dutch Health Council, in an overview of research from around the world, found no evidence that radiation from mobile phones and TV towers was harmful. A four-year British survey in January also showed no link between regular, long-term use of cell phones and the most common type of tumour. But at the Swedish National Institute for Working Life looked at mobile phone use of 2200 cancer patients and an equal number of healthy control cases. "Of these 905 cases, 85 were so-called high users of mobile phones, that is they began early to use mobile and/or wireless telephones and used them a lot," said the authors of the study in a statement issued by the Institute on Friday. Published in the International Archives of Occupational and Environmental Health, the study defines heavy use as 2000 plus hours, which "corresponds to 10 years’ use in the work place for one hour per day." Kjell Mild, who led the study, said the figures meant that heavy users of mobile phones had a 240 percent increased risk of a malignant tumour on the side of the head the phone is used. "The way to get the risk down is to use handsfree," he told Reuters. Bh. Susan took Hari-nama-diksa from Prahladananda Swami this morning. She is now Sarva-mangala Dasi. 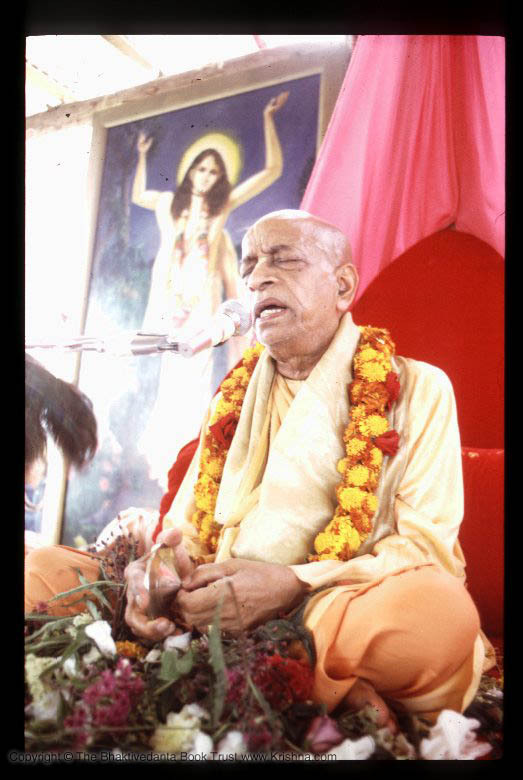 Devamrta Prabhu attended the yajna to complete his Mantra-diksa taken from Bhakti-tirtha Swami last year. More shots here. Whew, after a few hours of mucking around I’ve just managed to fix up my web server and get the Ratha-yatra pictures on line. The deity shots aren’t the best either. The colour balance was out. I mucked up the white balance settings. You’ll get the general idea though. 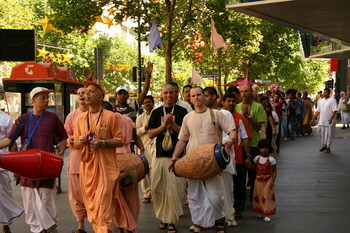 That line contains just over 200 devotees in all.